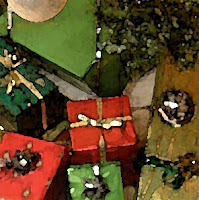 It’s a challenge we face every year -- what to do about gifts for Christmas. It’s daunting, it’s complex, and something we find hard being inventive about. Panic, procrastination, and yes, fear, get in the way of creative thinking. Some people give up entirely! Don’t buy something awful just to cross someone off your list; there is no heart or creativity in that. Here’s an approach and some creative ideas to address the Christmas Challenge. It’s not about money, it’s about creative thinking! Many of these suggestions will work for even the most Scroogian of budgets. 1. Write Something Personal in a Well-Selected or Hand Made Card. Christmas cards seem to be diminishing as a tradition but why not make a card a very personal and meaningful gift? Don’t just sign your name, write a real note. If you have time, make a card yourself. I have an old friend that makes a simple card every year from plain old white card stock. He hand draws a design in two colored pens -- and it’s beautiful in its simplicity, and I'm charmed by the personal touch. I look forward to seeing his new one every year. In your note be generous with your love, affection, and acknowledge what that person means to you. Share your heart and you’ll touch theirs. 2. Send Pictures. Pictures are personal and make a meaningful gifts. Find, or create, a really good photograph, tailored for your inner circle. I know the web makes it easy to post pictures for sharing, and you can do that (if you do, try www.flickr.com, it’s so easy), but an old-fashioned photograph is something that is treasured. There are a lot of interesting ways to print photographs these days, so print them on canvas or sepia toned paper. It's also easy to get posters, mugs, or blocks made these days. Matting and framing can formalize the gift further. 3. Create a Cool Package of Themed Stuff. Combine several small gifts into a cool package designed around a persons interests. There are some clever combinations out there. For instance, how about a bag of fine coffee beans, ground to your friends’ maker style, with a mug of their favorite sports team (or fine artist, cat, dog, inspirational message…you get the picture) and some chocolates or nuts? Or create a Euro package of olive oils, fancy pasta, and a bottle of good wine. How about a golf package with some balls, tees, and a new glove for your duffer friends? Go back to that facts list in your notebook and create a personalized combination, it shows thoughtfulness, and they’re fun to create and receive. 4. Give Fine Art. Museum Shops are great places to find small gifts with class. Find out the favorite artist of your gifted. A coffee table book or a pack of cool Monet thank you cards are useful and personal gifts. Student art shows are often great places to buy interesting art at low prices. You have to know your target – to some people fine art is what matches their sofa! If that’s the case you need to know the sofa color! 5. Give Art Supplies. An under-rated place to shop for Christmas gifts is a good art supply store. I mean, who couldn’t use a nice fancy pen? For kids there are a lot of new fangled art supplies like Crayola’s Model Magic – a hipper and easier sculpting media than Play Dough. I’ve seen some really cool rubber stamps that are super low price and a lot of fun. For your pilot friend a cool stamp of an old World War I fighter plane is a near perfect small gift. A box of oil pastels and a high quality paper sketchbook with a set of Faber Castell brush style pens (http://www.faber-castell.us/) is an excellent gift for the artist in your life (hear that Mom?). 6. Help Decorate The Tree by buying gifts of Christmas ornaments. It’s rare they come as a gift; people usually get their own. Keep your eye out for ornaments that match the taste of your gifted and you’ll find something very appropriate for the season, and they’ll think of you fondly every year putting them up. Credit my partner Caroline for this one! 7. Christmas Tree Surprise Party, or, Put up a Tree. Wacky idea, but many people don’t have time to do a tree. If you know somebody who would like one but is short on time, sneak into their pad and put one up for them – you might need to be clever to disguise your intent! Get a small tree, a simple set of bulbs, lights, and frosting. Keep it simple and they can add on to your basics, if they get inspired. Imagine finding a tree all done without the hassle. To build on this idea, time it to be there when they arrive so you can have a glass of eggnog or a cocktail. Call it a Christmas Tree Surprise party. My father and I did this once years ago for a friend of the family and they’re still talking about it 40 years later. 8. Make Your Own Ornaments, go back to that art supply or crafts store and pick up some unique supplies and create something highly artistic and individual. Pick up a bunch of used jewelry at a yard sale and bejewel a standard bulb. Pick up pinecones and spray paint em silver! Harvest buckeyes (or conkers) and string them together with fishing line. 9. Donation in Their Name. Many people have everything they need, and in truth, gifts are pouring gravy on potatoes that are already swimming. Charitable Giving in someone’s name is a way to do something meaningful for those who already have a lot. Find out their favorite charity and make a donation in their name. Find or make a nice card and let them know. If you can’t afford to make a donation of money, how about time? Volunteering time to a worthy cause is a double gift – to the charity and to your friend. 10. Create a Quilt for a Sick Child. Another feel good idea that you can do in your own name, or in a friend’s name, is to create and gift a quilt to a child with a life threatening illness. There is an incredibly cool organization called Sewonderful Quilts that will provide you with fabric (very beautiful sample material otherwise destined for the landfill) and instructions. When done, you send the quilt back to Sewonderful who gifts the quilt to a sick child through children’s hospitals. These quilts are deeply appreciated by the children and their families. Go to www.sewonderfulquilts.com for more information. 11. Give Time. Many of our best friends and family pine for our company, and we for theirs. In our fast paced world we rarely spend a generous amount of time with those we love, we parcel it out in small doses and squeeze it between other events in chock-a-block schedules. Why not gift a juicy chunk of time, an afternoon, or a whole day? Wrap up a small box with a clock inside and enclose a note suggesting a day and do something you both like, on you. A ball game, a museum trip, casual shopping, a drive in the country, a long walk or bike trip. Let them decide what and how, or if you’re confident, get it all mapped out and add the element of surprise. 12. Write a poem. A poem about someone you know is a highly personal and special thing, so get out the pen, get reflective, look into your heart and just write it. Don’t worry so much about rhyme schemes, if that works, okay. Do try to avoid clichés. Just be honest about your feelings and you can’t go wrong. One more tip, write about something very specific that you like or find interesting that will focus your poetic efforts. Then, take some care and package your poem well, maybe combine it with candles and a reading by you. 13. Write a List of Acknowledgements. List 10 things you love about somebody. It’s hard to go wrong when you say out loud what you almost never do, but honestly feel. Somebody did this for me 15 years ago and I still have it in my wallet. 14. Gift a Special Meal. And make it special and all about them. Use your imagination and go the distance with favorite types of flowers, wine, deserts, music – everything. Don’t let them lift a finger. 15. Give a Florescent Fish. Many people are really too busy and mobile to enjoy a high maintenance pet like a dog or a cat. On the other hand there are low maintenance pets like goldfish which provide a lot of enjoyment without anywhere near the trouble. Beta fish are beautiful and easy, only need to feed them once a day. Put together a friendly fish package of a small fish bowl, food, fish, and some decorations. For a more interesting bowl, get a really cool modern vase instead of the classic fish bowl. See http://betafacts.com/ for more information. 16. Share Your Favorite Recipes. My mother put together a small booklet last year with her favorite recipes. She used added pictures and stories about our family. It was a lovely gift and I’ve gotten it out several times for the recipes and just to browse through. Put together a faves compilation for a personal gift. You can get as fancy as you want with it, from a stapled sheaf of several you’ve copied or scanned, to a more elaborate booklet like my mother’s. The more love you put into it, the more it will be appreciated. 17. Share Songs. On the low budget end, you could record a song on your computer, using a free audio package like Audacity (see www.audacity.com) and email an MPG file, or, going another way, buy gift certificates to iTunes for your iPod-loving friends and family. iTunes allows you to buy printable gift certificates, which are a great last minute solution. If you’re ahead of the game you can gift either via email or snail mail. The snail mail varieties have those great Apple designs that add some sparkle. See http://www.apple.com/itunes/store/gifts.html. You can even gift a favorite set of songs, a playlist, nice, I’d love to get a cool new playlist for working out, or for long drives. Maybe your loved ones will too. Or...call a friends voice mail and sing them a special Christmas song. You will be the only one giving that gift this year! 18. Share an Audio book, a Movie, or a Favorite TV Show. Building on the previous idea, iPods playback audio books, movies, and TV shows as well as songs. It’s easy, go to See http://www.apple.com/itunes/store/gifts.html and they’ll tell you specifically how to do it. Amazon is a great alternative as well for books, DVD’s, and other media. 19. Say it with Flowers. We don’t normally think of flowers as a Christmas gift, and yet, why not? There are lots of ways to give flowers, from a hand-cut bouquet from your own garden, or, by ordering from a florist. Poinsettias are always nice at Christmas but don’t rule out a nice potted plant, or even a bonsai. It’s all online, Google flowers and you’ll find all sorts of vendors. 21. Give Your Heritage. For the older folks reading this maybe this is the time to pass along that ring your great grandmother wore to a younger generation, or that hand-carved butcher block your grandfather made himself. You’ll know in your heart if the time is right. The best things to pass on are those that are somewhat symbolic of your family, or have a great story attached to it. 22. Hand Write a Miniature Book. You may have seen those tiny little blank paged notebooks in a stationary or art store. I’ve seen very nice ones sized about two by two inches with a leather cover and a leather tong that wraps around to tie it shut. Buy one, and fill it with whimsical thoughts you are having around the holidays, and thoughts you have about the friendship or love you have with someone. It can be words only, but with some colored pens you can add the occasional page of little drawings of holiday things like trees and stars, hearts, flowers and other fun, loving and gentle images. I have an idea to do one with only one word per page. Just start and let it flow and have fun, use your mistakes and it will be even more charming. I can practically guarantee that you’ll be the first and only giver of a handwritten book. 23. Gift a Historic Tree. Any tree huggers on your list? I ran across a nursery that has trees that are offspring of Apple trees that Johnny Appleseed planted, Oaks from Elvis’s Graceland, or Mark Twain’s boyhood home in Hannibal, Missouri, Walt Disney’s boyhood home, Steven Foster, trees from various presidential estates, and a wide sampling of trees with all kinds of history around them. A tree is a gift that keeps giving for generations, providing shade, fresh air, and beauty. Here’s the site address: www.historictrees.org.